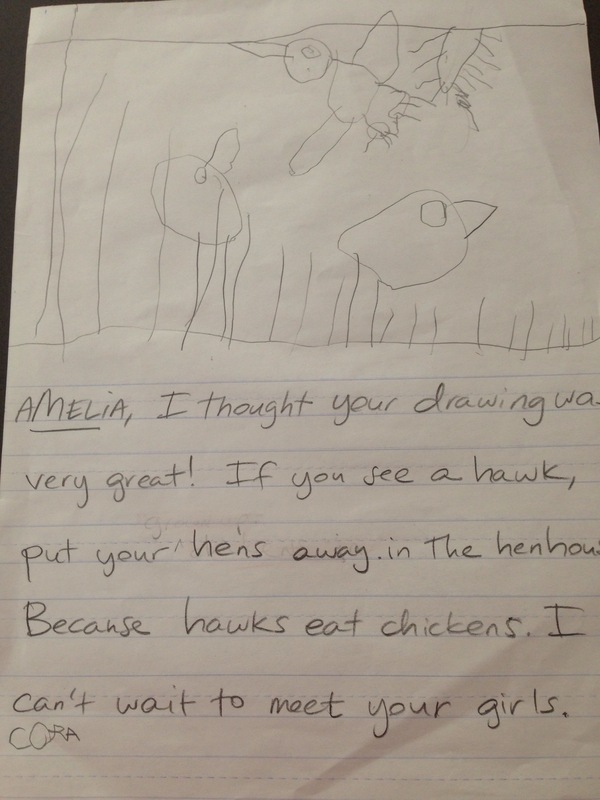 Cora’s friend sent her a drawing of her baby chickens last week. It was sweet and simple. I suggested she send a drawing of our girls in return. She dictated a message and I wrote it for her. She proceeded to make marks on the paper with glitter glue talking her way through. In the end, she had a collection of blobs haphazardly scattered around the page. After some discussion, I convinced her to give it another try. Afterall, she was trying to communicate an important message to her friend. We talked about where the chickens would be standing and where the hawk would be flying and she made lines for earth and sky. That seemed to be all she needed. Something to break through the blank slate. She added a sun, grass, and a few hens. Finally, we talked her way through the hawk – head, beak, body, wings, feet, and her favorite part – super long, sharp talons. I told her, again, how proud I was of her work. I knew she could do it. And I can’t wait for her to do it again. My last post was about the picturebook Home by Carson Ellis. At the end I set a plan to engage Cora further with the theme of home through art making. On a sunny day last week I got her to go outside with me for an observation drawing session. I have long been a fan of a little book called Observation Drawing with Children. I’m sure I’ve written about it here before. The authors describe observation drawing as a responsive process by which “the viewer become[s] aware of the elusive as well as the obvious qualities of subjects,” (Smith, et al, 1998, p. 6). As such it is easy to understand learning to draw as part of learning to look more closely at and see the world around us. When I had a daily practice of drawing from observation I felt more connected to things around me, more mindful of my surroundings. Cora hasn’t even shown much interest in making original drawings (realistic or imagined). You can imagine how sad this makes me as an art educator… She has made some incredible drawings over the years but it’s not really her thing. “You like to draw. I like to sing,” she tells me. Knowing this, I shouldn’t have been surprised that she was a somewhat reluctant participant in my plans. We started by looking at the cover of Home and picking the house that most resembled ours (a log cabin). Then we talked about the shapes and lines that make up our house. Smith, etal write extensively and provide examples of dialogues with children to help readers plan for their own observation drawing sessions with kids. There is something about the back and forth between looking, naming, and drawing that helps make everything more concrete. Cora had no trouble talking about our house. We named the major shapes we saw. We talked about what rooms are behind each window. But when it came to putting these ideas down on paper, she stalled. She’s afraid of “doing it wrong” and, I think, disappointing me now matter how many times I tell her I’m going to love whatever she does and remind her of the great drawings she has made in the past. I have to remind myself not to push her if she’s not ready for this. In the end, We worked together on the drawing. I made lots of the big shapes (the fame of the house and windows, for example) and she drew the details (panes of glass and siding). We’ll try this again soon. Like anything, I believe practice breeds confidence. My hope is that at some point she’ll take off on her own and find a love for drawing all that she sees – at home and abroad. Our yellow door is a defining feature of our home. Testing greens to find the best match. It’s been a long while since I wrote one of these columns. It isn’t that we aren’t reading! We read like crazy this winter, but I was TOTALLY insane at work and didn’t have time to blog about any of it. That said, I dedicate this post to my department chair, Craig Roland, who recommended Home, by Carson Willis during one of the million and one meetings we had with students last month. One of the greatest parts of my job is the opportunity to learn alongside my students. Sometimes they teach me things, sometimes I learn from my colleagues as they are teaching. Craig draws on a wide range of resources when speaking with students which I appreciate. Home is a perfect example. I don’t remember the exact context of Craig’s suggestion and it doesn’t much matter. The book is a good illustration of a work of art that explores a big idea. Big, or enduring ideas “comprise concepts that have drawn the attention of humans through the ages” (Stewart and Walker, 2005, p. 17). We encourage students to build art education curriculum around big ideas throughout the Art Education program at the University of Florida and I plan to use this book in the future to help students better grasp the concept and consider ways to utilize it with students. Parents of young children and other educators might also find it inspiring. How would it feel to live in that home? What makes your home different from other homes? The cover of Home alone could launch many questions, leading teachers and students in various directions as they connect the theme with their own experiences, books they’ve read, and cultures they are studying. This is one of those picturebooks that could be given to an adult to read and reflect on just as easily as a child. The illustrations are engaging – visually and conceptually. Cora and I spent a long time looking at each one, talking about the content and the style. The one about The Little Old Lady who lived in a shoe was one of her favorites. This is just an excerpt…. The so-called clean home didn’t look clean to us so much as it looked boring or unoccupied. Everything seems to have a purpose and a place in the messy house, even the jump rope in the front yard, the bathtub in the garden, and the cinderblock holding up the front porch. But overall, the artist captured a wide range of homes (including her own studio filled with references to the book itself) and had us looking and imagining who lived in them and what it would like to join them. Me: Cora, where is your home? Me: Is it on the moon? Me: Is your house in the city or the country? Cora: The city. I think. Do you think that’s the truth? Me: Yes. But what makes you think so? Cora: Because it’s noisy. And there are lots of cars on High Street. Me: What kind of house do we live in? Cora: We live in a regular house. A house. Me: What’s a regular house? Cora: Just a regular house. Me: So not a castle or something like that? Me: What’s different about your house and Maya’s house? Cora: We have a dog and she has cats. My house is darker because it has more curtains. Me: What else makes our house darker? Look outside? What do you see? What would you see if you were at Maya’s? Cora: Other houses closer together… Street lights. Me: What else do you want to tell me about our house? What makes it special? Cora: My house is very old because it used to be grandma’s. That what I like about it. She lives next door now and I like that too. Next step, mapping our house and making some drawings of it. Stewart, M. G. & Walker, S.R. (2005). Rethinking curriculum in art. Worcester, MA: Davis. 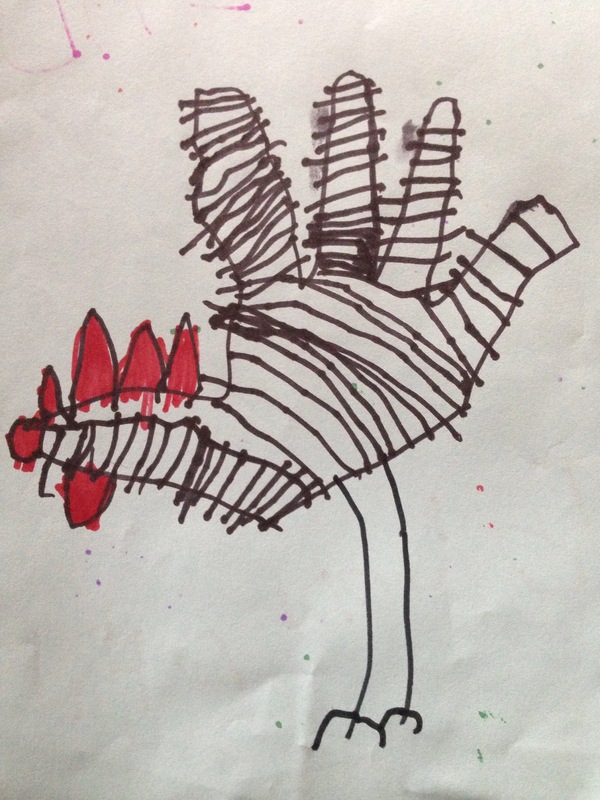 Quick follow-up to last week’s post about the thinking drawings of young children. I reached into the seat back in front of us and pulled out the safety card. Together, we looked at the photo of a plane on the cover and the diagrams inside. The conversation dissolved into a discussion of the pictographs used to tell passengers what to do in an emergency. I love to deconstruct international symbol systems so I as happy to follow the tangent. After a few hours of screen time – I graded papers while she played with nearly every app loaded on our iPad – it was landing time. She asked for some paper and markers and started scribbling. After a quick self-portrait, she asked for help drawing a plane. I suggested she start with a large oval – like a hot dog and she was off. 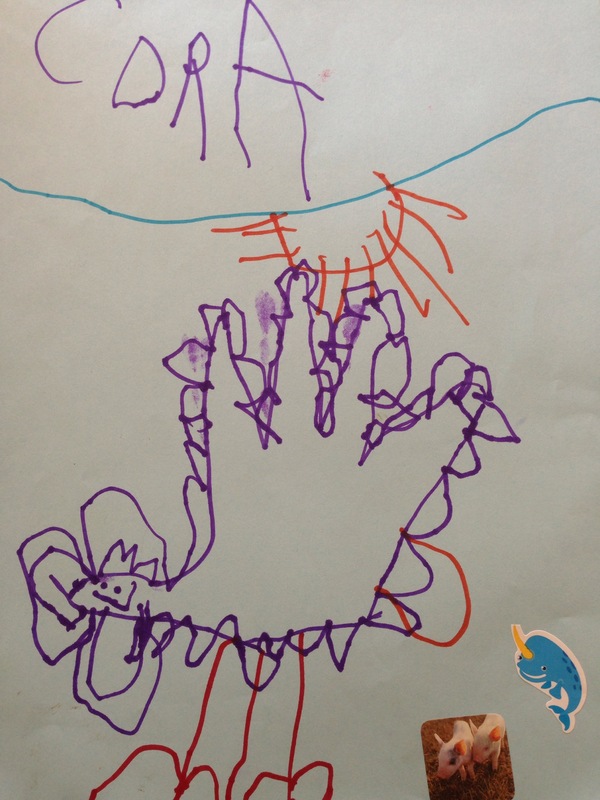 She drew one end rounded and other ended up pointed to which she said, “Oops,” and looked up at me. I told her I thought it looked great that way since the nose of a plane is usually rounded and the tail pointed. Satisfied, she added a few tail fins, then wings, windows, and finally a logo on the wing. And just like that, she made one of her greatest thinking drawing yet. Right in front of me. I was mesmerized. At one point she pulled the safety card out again to check some details, but quickly put it back down and drew the parts as she imagined them in her mind’s eye: from her time looking out airport windows in the past, from her Playmobil toy plane, and from our earlier discussion and study of the illustrations. If you’re as amazed by this process as I am, and you are interested in helping children improve their observational drawing skills by talking about the world they see around them, I recommend Observation Drawing with Children by Nancy Smith and the Drawing Study Group (1997, Teachers College Press). I think I’ve mentioned it before. I’m sure I’ll mention it again.